I love classics. A lot of people are surprised when I tell them that classics are my preferred genre. Some people can’t seem to fathom that I genuinely enjoy reading books like Faulkner’s Sartoris and Dickens’ Great Expectations and choose to read them in my free time. Perhaps this bewilderment is due to the bad reputation classics have gained from people’s negative experiences of being forced to read them in school. Or maybe classics have become too closely associated with the stereotypical pretentious air that some people put on when talking about this genre of literature. Whatever the reason may be, I’m here to break the barrier once and for all. Classics don’t have to be scary, dull, or irrelevant; rather, they can be accessible, exciting, and relatable to our personal and societal experiences today. There are always going to be those books you just don’t click with (I’m sorry Bram Stoker, but I just reread Dracula and practically had to force myself to read the last hundred pages) but that doesn’t mean that the entire genre isn’t worth reading. 1 || Know the context. Before reading, take a few moments to research the time period and place in which the work was written as well as some information about the author. Knowing the context of a text is helpful for two reasons: a) you can better understand and relate to the characters when you know when, where, and how they are living and b) it helps explain any behaviors or beliefs that might seem odd or problematic to us today. Learning information about the author can also give us insight into why and how the text was written. For instance, while researching Faulkner I learned that he often listened to his elders tell stories about the Civil War, slavery, and his great-grandfather William Clark Falkner. The latter figure must have strongly influenced Faulkner because a similar legendary relative plays an important role in his novel Sartoris. Understanding the context of a work can make it easier to relate to the story overall. 2 || Make character maps. Wuthering Heights? The Sound and the Fury? Forget it: I would be completely lost and confused if I didn’t sketch out a character map. You can make one as you read, though I prefer to research the story ahead of time and map out the characters that way. There are countless helpful resources online that make creating character map easy and incredibly helpful. Even just writing a list of characters and some short descriptions of them can make following the story feel ten times easier. 3 || Take your time. Unless deadlines are imposed on you by others (teachers, professors, book clubs, etc.) there’s no specific point in time by which you have to read a classic. Go as slow as you need to in order to get the most out of the story, even if it takes you twice as long to finish as a different book normally would. Put it down and come back to it after a few days if you feel like you need a break or are feeling in the mood to read something else. There’s no pressure to read anything in one sitting or in a certain number of days, so don’t worry about how long it takes you to reach the final page. The more time you spend with a classic—or any book, for that matter—the more you’re likely to take away from the novel. 4 || Keep an open mind. As with anything you read, it’s important to keep an open mind that’s free from any preconceived judgments or expectations. There’s no use reading something when you already assume you’ll hate it before you even read the first page. Before starting Leo Tolstoy’s tome War and Peace I expected that it would bore me to tears; however, I was surprised to find that I actually looked forward to reading it more and more as I progressed through the novel. I know this tip probably sounds like basic common sense, but sometimes it’s helpful to be reminded of what would otherwise seem obvious. At times it can seem like classics are a genre of literature with their own rules and expectations; in actuality, they’re just like all other books! It’s perfectly okay to not enjoy classics. I don’t go out of my way to pick up horror or paranormal novels and I don’t judge those who do. However, I do think that classics deserve a second chance. Do you enjoy reading classics? Do you have a favorite? 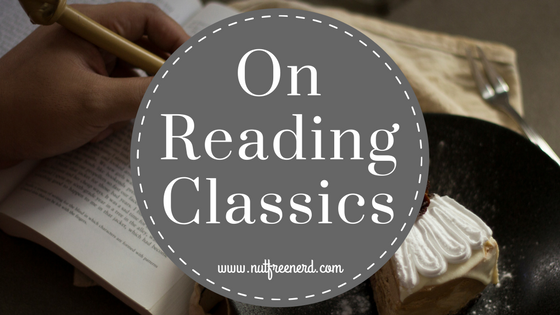 Did reading classics in school impact your feelings toward this genre? Let me know in the comments section below! This is a great post, thank you! I’d really like to read more classics and these tips will be really useful. Normally I get interested in reading a book because I already know something about it or have seen a cool adaptation (like with Les Miserables or Jane Eyre) but it takes me a while to actually pick them up. As for reading books at school — to be honest I find that studying any book at school isn’t very good for enjoyment because we spend like, an entire term reading it and it drags on a lot. But I think that’s just the style of our course, alas. Great tips, I especially agree with doing research first. It definitely helps giving context and appreciating the book more. Good post! I am definitely one of those who burned out on the classics in school. I was an English major with an American Lit minor. I can remember taking several Lit courses at the same time and having to read a couple books a week! It was grueling to get through some of them. However, I do think that I need to try to pick one up and try to read one. i think I may try to read a Jane Austen novel. Do you have any suggestions? Thank you! 🙂 The only Jane Austen novels I’ve read are Pride and Prejudice, Persuasion, and Emma. I definitely enjoyed P&P and Persuasion more than Emma, so maybe one of those? I love classics, and I love contemporary literature. They are all stories. I think schools impose complex, demanding books on people before they’re often ready to tackle them. I was ready, because I was an obsessive reader since age four, and had eased into the great Classics through lighter, easier ones as a kid reading on my own: “The Count of Monte Cristo” is not a great book, though it’s a classic, but it’s a great book when you’re a young reader. There’s so much to be had from the capital-C classics; they are Classics because they are nearly perfectly written, poetic, exciting, and explore the depths of character where monsters often swim. Battling those monsters is the story of humanity itself. “War and Peace” told me more about the curse of human pride, and of groupthink, than years of studying politics and psychology; “David Copperfield” is about the corrosive effects of poverty and (again) perverted pride; “Sense and Sensibility” explores several very popular ways of fooling oneself and how people use pride to use each other. But they all do it in a way that creates new universes inside your head; they make your life richer. They are not advice columns in a daily paper; they root you to the universal that you’ve been ignoring inside your own soul. And some of them a funny as all get-out: Melville is nearly as funny as Mark Twain, and Dickens can be absolutely hilarious, even in the midst of darkness. Victor Hugo (at least in French; I’ve never read him in translation) wrote the funniest single comic scene I’ve ever encountered in any medium in “Les Miserables.” That’s no laughing matter; only humor can help us survive ourselves sometimes…. I read all kinds of stuff: detective novels (though mostly classic ones), works in translation from everywhere (Murakami et al), works in English from other cultures (Hosseini), future classic authors such as Susan Straight, poetry, whatever. It’s language that makes us human; other beasts have opposable thumbs or big brains, but only we encode sensation, action, and emotion in words. And then we further encode words in little black squiggles on a screen or sheet to speak to others who are otherwise beyond our lives in space or time. To read, and to write, is to create civilization; the Classics are classic because they do it best.. Yes! You make so many great points. Classics (like all books) can teach us so much about ourselves. Thanks so much! I love reading classics. Not all classics. Some have bored me to tears. Others just didn’t resonate with me. But I can read something like Jane Eyre or Great Expectations and enjoy it in the same way that I might enjoy a contemporary novel. Other classics I enjoy differently. I do have to approach them as more of an academic exercise at least initially. If it’s a good book I eventually internalize the context in a way and get swept up in it. But a lot of classics just need time. They were written for a society that wasn’t nearly as fast paced as ours is. So they don’t move right into the action in the way that a contemporary novel might. But sometimes there’s something nice about making a leisurely trip through a book, and getting a firm foundation on the characters and setting before diving into the action. I love your point about classics needing time. I think that’s what trips a lot of people up when they go to read them. Often times you can’t fly through them as fast as you would a contemporary novel, but that doesn’t mean they’re not worth reading. Ug, I hated Dracula. So boring. I usually love classics, though. I think school ruins classics for a lot of people. Writing essays is never fun, and reading difficult books on a deadline is stressful. Great tips! That’s so true: the assignments associated with reading classics definitely takes some of the fun out of it. Thanks! It was better when I was in college, because then the teachers gave me the historical overview pertaining to the story. I’ve got a shelf of classics that I like to pull out when I’ve got “nothing else to read” every now and then, but I know there are some that I’ll never go back to. Sense & Sensibility is one, and Ulysses is another, with To Kill a Mockingbird topping the list. I feel like a lot of the time people are annoyed by classics because so many of them are forced on you in high school and for people who aren’t readers, that’s not the way to go about it. WHY. WHY WOULD YOU WANT TO READ ULYSSES?! I realize now I did some terrible word choices in my original reply. Sense & Sensibility, Ulysses, & To Kill a Mockingbird are some of the WORST AND MOST INFURIATING BOOKS I’VE EVER READ. Ulysses is atrocious. Please do yourself the favor and avoid suicidal tendencies and don’t try to read it. I also agree with knowing the time period. People seem to have this general idea that all classics are from the 1800s (at least, that’s what I get when people describe why they don’t like them). And that’s obviously not true. There are enormous differences in writing in different centuries. Haha don’t worry, that’s the response I usually get when I tell people I love reading Faulkner 🙂 Love your point about knowing the time period! I’m so glad you found this helpful!! 🙂 Character maps make everything SO much easier to keep track of! This is a wonderful post. I really want to pick up a few classics throughout the year, but time management usually gets in the way. I love that you do a little research before diving into a book. I’ve found knowing the context of classics to be soooo helpful for the few times I read them. I wish my high school English teachers had put a little more time into familiarizing us with the context of the stories we read because it really can make certain stories so much easier to understand and connect with. Same!! I feel like each classic should have been accompanied by a mini history lesson. That would have made it so much easier to understand! I’m not stuck on any genre. I like books period. Including some classics (in spite of whatever efforts the schools made to steal all enjoyment from them – see this Top Ten books from school post on my blog https://jhohadli.wordpress.com/2017/08/22/top-ten-school-edition) – in fact, you named two of my favourites in this post Great Expectations and the Great Gatsby. The way I look at it classics were once just books of many different genres just like the books we read and enjoy today. The pace is sometimes slower and the context removed from my own but that’s okay; if the story’s good it will still grab me. Re your list, I like to dive in to a book so I don’t see myself doing all that advance work but I do agree with taking your time and keeping an open mind…and if my curiousity is stirred I’ll research things along the way. Great Expectations and Great Gatsby are fantastic! ❤ I really love your point about classics being books that were once read just like our contemporary books are today– the context is just different now. I love classics and I think everyone ‘should’, though I can understand why they do not, especially if they were forced to read them at school. Obviously, whether or not a person enjoys a book is very subjective, and it is a diverse genre, so I am sure anyone who says the don’t like classics just hasn’t tried hard enough to find ones they do like. Secondly, what gets categorized as a ‘classic’ changes a lot over history. Romeo and Juliet is a well-known Shakespeare today, but has been largely ignored at other times. So, the argument that classics aren’t ‘relevant’ does not hold since whatever classics are being read are the ones current people find ‘relevant’. A century from now many of the classics we are now reading will be ignored while others will be ‘rediscovered’. Finally, relevance aside, there is the durability factor. To be a classic in the first place a book needs to transcend its own time and very few manage it. They endure for a reason and I certainly find contemporary books, even the ‘literary’ ones, to be very hit-and-miss, while the classics are far more hit than miss. I love your point about the relevance of classics. “Classics” are dynamic, as is any other genre, so you’re bound to find one you connect with eventually. I also love how you expressed your last point about classics being “more hit than miss”– that’s perfect! I’ve enjoyed so many classics– even if they’re not necessarily the most fast-paced or exciting stories, they can be incredibly well-written and leave me with SO MUCH to think about. I’m a fan of classics, but I’ll admit that I didn’t become a fan of classics until I took a Medieval literature class as an undergrad lit major (it was because I had a crush on the professor). She put Beowulf in historical context, and then reading it became like a game to see how the values of medieval people played out in the writing. This is also why I love Victorian literature so much. The values are clear, and it’s interesting to see the commentary on those values by literary types of the time. What a great post! I love reading all kinds of books, but classics have always been at the top of the list. I like what you said about not imposing a deadline on reading. I just have to take my time and not get hung up on how many books I’ve read in a year or that kind of thing. I read Faulkner’s Light in August a long time ago and really liked it. I’ve yet to tackle The Sound and the Fury. Some day, though. Thank you!! If you enjoyed Light in August then you’ll likely enjoy The Sound and the Fury as well. The different narrators makes it a much more compelling and interesting read than Light in August (in my opinion). Both are fantastic, though! Another great post, Holly. I do enjoy classics, but much like contemporary books, I have to be in the right mood to read one. Most of the time I tend to reach for fantasy/paranormal reads. However, I will always have a special place in my heart for classics. I mean, I did earn a BA in English Literature, so I’ve read a number of classics, and I mostly enjoyed them. I think knowing context is key. For some reason people think of classics as all being the same in terms of genre and writing style (like all classics = the Victorian novel) but there’s a world of difference between, say, Virgina Woolf and Charlotte Bronte, or J. R. R. Tolkien and Louisa May Alcott! That’s so true!! Knowing a lot about Victorian England only gets you so far when it comes to classics, especially from different countries. I really like reading classics in school because it gives me a structured approach to all the things you mentioned above and an outlet for my thoughts, so I have a good reason to pay attention to and respond to the novel. And you also get to discuss with others which is always fun. I do like reading classics sometimes, especially the social commentary ones. Also, I wanted to let you know that I got How To Ruin Everything from the library because of you. I’m so glad this post was helpful! The Lizzie Bennet Diaries are hilarious ❤ I haven't watched an of the other ones, but I'm sure they're great as well! I wish I loved classics! I’ve only read a handful (The Importance of Being Earnest, Northanger Abbey, Anne of Green Gables, To Kill a Mockingbird, Fahrenheit 451) but I haven’t read the must-read classics like Pride and Prejudice, War and Peace, A Tale of Two Cities etc. I really want to read them, though! I struggle to get into classics and I prefer reading children’s classics and modern classics. I’ll definitely give these tips a go, though! The character maps will probably be a huge help! Great post. I’ve been a lover of classics ever since my grandma introduced to me to Jane Austen a few years ago though sadly I haven’t read as many as I would like.